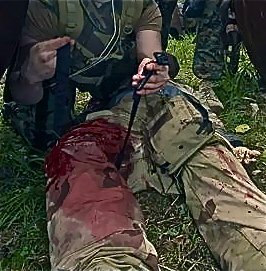 Sometimes severe bleeding is caused by major injuries like partial limb amputations, deep lacerations by a sharp object or animal attacks (like a bear or shark attack) can not be stopped by direct pressure. Using a Constrictive Bandage/Tourniquet is a LAST RESORT so if you have not already done so go to First Aid for Severe Bleeding. As well as tried to block the artery that supply's blood to the injured area, and these techniques have not stopped this life-threatening bleeding. Then you may need to resort to applying a constrictive bandage (tourniquet). QUICK SUMMARY: 1. Make a tourniquet use Strips of cloth, wide belt or similar. NON-elastic is best. 2. Tie it firmly until the pulse below is no longer able to be felt and bleeding has stopped. 3. Write down the time of application. 4. After 30 minutes release the bandage and check if the bleeding has stopped. If it has then remove the constrictive bandage. 5. If significant blood flow continues than apply direct pressure to the wound site. 6. If this does not stop the bleeding then reapply the constrictive bandage and check again in 30 minutes. 7. DO NOT forget to write the NEW time down. 8. When bleeding stops apply a sterile dressing and bandage. **Please review the below explanations of these steps. ** If the injury involves an amputated limb please also read Uncontrolled Severe Bleeding involving a partial or full amputation (below). Here is a more IN-DEPTH EXPLANATION of the above steps to treat uncontrolled severe bleeding:- What is needed to make a tourniquet:- Strips of cloth, wide belt or similar. NON-elastic is best. About the width of a large car key (7.5 cm or 3 in) and the length of a medium size leg (75 cm or 30 in). Use your creativity e.g. use a folded or torn to size cloth/sheet or a folded triangular bandage. How to apply a constrictive bandage:- Wrap the cloth firmly around the injured limb between the heart and the bleeding wound. Usually above the knee or elbow. Tie it firmly until the pulse below is no longer able to be felt and bleeding has stopped. If you have difficulty tightening the bandage tie a knot then put a stick, pen or similar on top of the knot and than tie another knot. Turn the "stick" to twist the bandage tighter. Just enough to stop the bleeding and pulse below the tourniquet. Secure one end of the "stick" to the limb to stop the stick from untwisting. Write the time of application on the person's skin if at all possible (as a paper note so easily is lost) and so medical staff can see easily and quickly when it was applied. After 30 minutes release the bandage and check if the bleeding has stopped. If it has then remove the constrictive bandage. If significant blood flow continues than apply direct pressure to the wound site. If this does not stop the bleeding then reapply the constrictive bandage and check again in 30 minutes. DO NOT forget to write the NEW time down. This is easily forgotten and may cause action by medical staff that is not needed. When bleeding stops apply a sterile dressing and bandage if available if not then use something clean like a shirt or clothing to prevent debris or the like from entering the wound. VERY IMPORTANT NOTE: It is vital that the tourniquet is clearly visible and not covered by clothing, blanket or the like. Ensure that you tell medical staff the location and time it was applied. Uncontrolled Severe Bleeding involving a partial or full amputation. If this is the case once the severe bleeding has stopped at the attached limb or if help is available proceed to do the below:- Partial Amputation If the limb is partially severed then any kinking or twisting should be corrected where possible. Then cover the wound with a dressing (sterile if possible) or improvise with a clean cloth or the like. Splint the appendage to the limb. You can use another part of the body, such as a leg or torso to immobilise the area. Consider putting a towel or similar in between the injured part and the splint for comfort. If available apply ice to the severed part but do not allow direct contact as this can cause the tissue to freeze and increase damage. If ice is not available then wrap a moist cloth around the part. Full Amputation Collect amputated part. Keep it dry. DO NOT wash or clean it. Trained Medical staff will do this. DO NOT soak it in water or any other liquid. Seal the part in a plastic bag or wrap in water proof material. If available put some ice in a container, place a cloth or towel on top of the ice and then place the amputated part that is already in the bag on top (it must not be in direct contact with the ice and must not be soaking in water) Freezing will kill the tissue of the amputated part. If ice is not available than wrap the part in a moist cloth. IT IS VITAL that the amputated part travels WITH the person to the hospital NOT separately. Time is vital. If they get separated and surgery is delayed this may affect the viability of the amputated part resulting in the amputation being permanent.